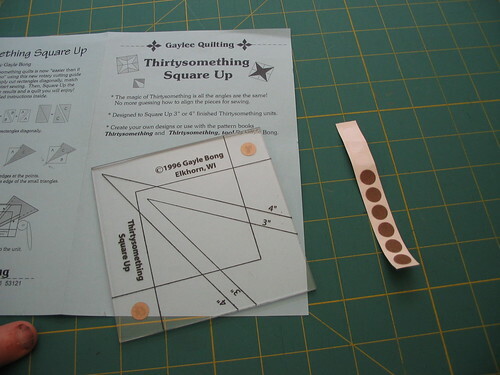 Gayle Bong donated a ‘Thirty-Something Too’ book and a companion square-up ruler to the guild, so I thought I’d start the gadget demos with her ruler tool. I made two sizes of thirty-something blocks, both the 3.5 and the 4.5 inches. They’re both marked clearly on the ruler. If you’re new to quilting then it’s a good time to remind you that most rulers are hard plastic and will slide on the fabric unless you add a non-skid aid onto the ruler. I usually add little rounds of fine-grit sandpaper but little pieces of sticky-back felt on the ruler would also work to hold itself in place nicely, especially on fabrics that sandpaper would be too rough on. Gayle’s directions are great and as long as you remember to always sew the longest part of the triangle to its neighbors it’s easy enough to accomplish. For both sets of the blocks I sewed, I added narrow sashings and cornerstones as I really liked how these brought the larger blocks together. 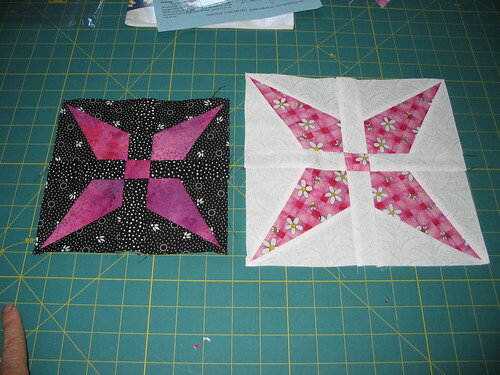 In one size I sewed pink and black pieces, and in the other, pink and white, so I could see the difference between having a light and a dark background in the same pattern. I will say I’m not a fan of cutting or sewing triangles, in part because I’m not very good at it. Unless I kill the piece with starch, the bias edge distorts too much in sewing for me to be pleased with the accuracy of the results. 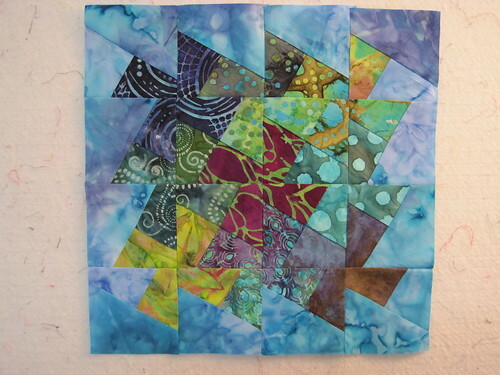 I think it’s always better to sew while the bias is stabilized and then cut the triangles after sewing. For example, I always sew half-square triangles in some sort of grid before cutting them apart. But that said, a trimming tool is wonderful compensation for less-than-perfect sewers like me. I found I could sew the thirty-something blocks together accurately enough to use the trimming lines and assemble them into larger blocks without much difficulty. The interesting part of Gayle’s idea is that it gives you a 30-60-90 ‘cone’ shape that can be replicated in many unusual ways. I love all the star blocks that result. Plus there are some great pine-cone style patterns that emerge when you stagger the blocks and place the colors carefully. To see the whole set of pictures I took while sewing the thirty-something blocks, click here. You can find Gayle here at her website and here at her blog. If you want to try out her book and tool, it’s here in the gadget library for borrowing. 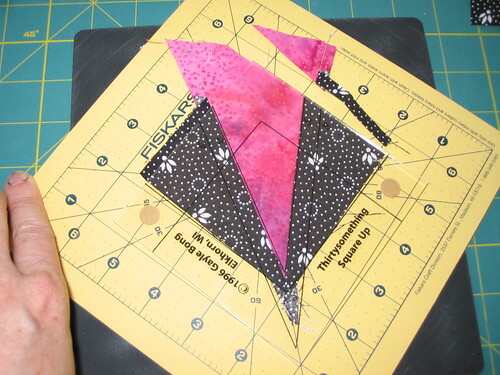 I did notice that some of her patterns call for the use of a ‘Clearview Triangle’ which cuts 60 degree angles, which we also have in the gadget library, so you can check both tools out if you don’t already have at least one Clearview Triangle in your gadget stash. Coming up next: how lazy can a girl be and still use the ‘Lazy Angle’ by Lazy Girl???? One of the best investments I’ve made in my studio so far is the 8’ by 10’ design wall. Made of insulation foam board, affixed to the wall and covered with batting, it provides a sticky surface for pieced cotton blocks, and an opportunity to stand back from your work and notice how it works at a distance. 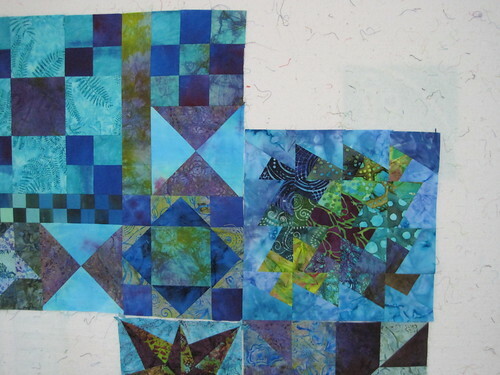 Above is a composition in progress designed by the homeschoolers I teach. They’re studying quilting as both an art and a mathematics class and if you’re a quilter you know you use both in everything you make. 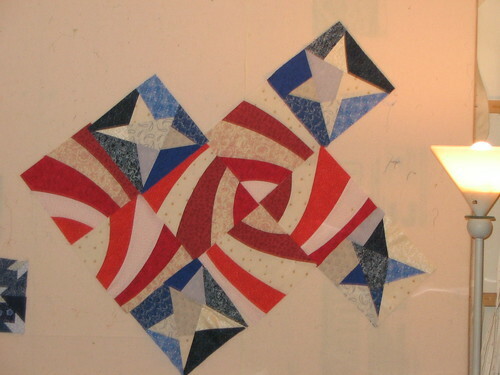 The curvy striped blocks made by the homeschoolers look plain by themselves but when laid out with the funky stack-and-shuffle stars they sewed, a whole new energy emerges. When seen close-up the stripes don’t match, but from far away the center blocks take on a kind of pinwheel effect that you can’t really see up close. The stars almost look as if they’re being flung away from the center, or maybe being spun by a sharp wind, shimmering like salmon scales as they twirl. It’s said that sometimes we can’t see the forest for the trees in our own lives. Maybe all we need is a design wall to get a little distance, and see things in perspective.